The Rev. D.D. 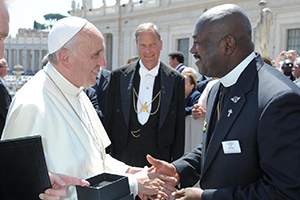 Hayes, senior chaplain for the DFW Airport Interfaith Chaplaincy, greets Pope Francis at an audience in Rome, presenting him with a paperweight etched with the airport logo, and a handmade rosary. If Pope Francis ever decides to visit the United States, flying into Dallas/Fort Worth International Airport might make the top of his “to do” list thanks to a goodwill gesture by the airport’s head chaplain. The Rev. D.D. Hayes, an ordained bishop of several non-denominational congregations who oversees the DFW Airport Interfaith Chaplaincy, presented the pontiff with a DFW Airport paperweight during a June 19 audience in St. Peter’s Square. Rev. Hayes also gave Pope Francis a handmade rosary crafted by Marge Wick, a former employee of the chaplaincy program, who belongs to St. Ann Catholic Church in Coppell. Included with the rosary was a prayer card of Blessed William Joseph Chaminade — founder of the Marianist community. Wick and her husband, Charlie, are part of a Denton group promoting his sainthood. When Rev. Hayes asked Pope Francis to bless a cross and several medallions for friends, the pontiff placed his hands over the minister’s and said a prayer over the items. The chaplain, who counsels and comforts passengers and employees at the country’s fourth busiest airport, felt a spiritual connection with Pope Francis. Nilda Castro, a member of the Pontifical Council for the Pastoral Care of Migrants and Itinerant People until her retirement in February, arranged the papal audience. Rev. Hayes met the former Vatican worker in South Africa through his work with the International Association of Civil Aviation Chaplains. Rev. 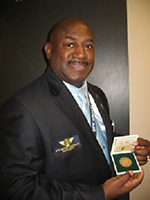 Hayes holds one of the medallions blessed by Pope Francis during his audience. But an unexpected twist in papal history seemed to put a crimp in the chaplain’s travel plans. “When Pope Benedict retired in February, I thought, ‘there goes my trip,’” he confessed. A call from the Secretary General’s office reconfirmed the arrangement with newly elected Pope Francis. News of the papal audience delighted Rev. Hayes’ own congregation, the Gospel Inspiration Fellowship Tabernacle (GIFT) Ministries, as well as the airport community. The chaplaincy program is currently working to replace a Catholic deacon from Dallas who retired and another clergyman who returned to his parish after a sabbatical. Deacon Jim Crites, executive vice president for the operations division at DFW Airport and a permanent deacon in the Diocese of Fort Worth, gave Rev. Hayes the paperweight — etched with the DFW logo — and a note of appreciation from the DFW Airport Board to give the pope. Dcn. Crites, who serves St. Patrick Cathedral, called the DFW Airport chaplaincy one of the most robust interfaith programs in the world. Because a chaplain must minister to employees, Dcn. Crites’ position with the airport creates a conflict of interest, preventing him from serving as a Catholic chaplain. Twenty volunteer chaplains, representing different denominations, walk the airport terminals helping distraught passengers or weary airline crews. If Pope Francis ever decides to visit the United States, flying into Dallas/Fort Worth International Airport might make the top of his “to do” list thanks to a goodwill gesture by the airport’s head chaplain. The Rev. D.D. Hayes, an ordained bishop of several non-denominational congregations who oversees the D/FW Airport Interfaith Chaplaincy, presented the pontiff with a DFW Airport paperweight during a June 19 audience in St. Peter’s Square.